The Weiser Field Guide to the Paranormal by Judith Joyce is a go-to guide for those interested in a broad range of paranormal subjects. If this is an area that interests you, this is an excellent book to enjoy on a dark and stormy night. “Stranded motorists on a lonesome road are rescued by angels. The phone rings with a call from beyond the grave. A blood-sucking predator is sighted again in the south of Texas. The Weiser Field Guide to the Paranormal is your gateway into the world beyond the known. Covering topics from cryptids to psychics, telekinesis to telepathy, this concise handbook will guide you through the eerie, the undeniable, and the strange world of the paranormal. 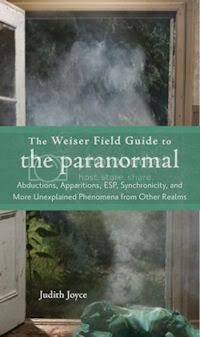 The Weiser Field Guide to the Paranormal is a well written guide to just about everything you would want to read about on the paranormal. Judith Joyce does an excellent job covering large range of topics to give a broad spectrum of the paranormal field. Nothing is covered too extensively, which works fine for this type of a book. If there is something that really interests you, there are other books available on just that topic that you can read more about the specific subject. I’ve been reading and researching the paranormal for over ten years, and even I found new topics in this book to read and do further research on. This is a superb book that will hopefully entice you to also want to read more about the subjects that you find interesting. Be careful with that though, because you might want to learn more about everything! I highly recommend this book to everyone curious about the paranormal field too. * Thank you to the publisher of The Weiser Field Guide to the Paranormal, Weiser Books, for providing me with a copy of this book for review. All opinions expressed are my own. I like reading about all types of it, just nothing too in depth. This is the type I like, thanks!